Slow down for kiwi on Kiwi Coast roads! You are here: Home / Kiwi Coast News / Slow down for kiwi on Kiwi Coast roads! A number of communities involved in the Kiwi Coast have reported kiwi road deaths recently. An unfortunate consequence of thriving kiwi populations seems to be an increase in kiwi being fatally hit by cars. The more kiwi we have, the more likely we are to encounter them in our backyards and on our roads. Kiwi Coast groups implore motorists to slow down in kiwi areas and to give up on aiming the car for that brown blob coming up on the road at night. You may think it’s a possum. It could well be a kiwi. Leave the possum control to the trappers, slow down and steer well clear. That’s the safest plan. Puketotara Landcare, Riverlands Landcare and Backyard Kiwi have all reported kiwi hit by cars on local roads. 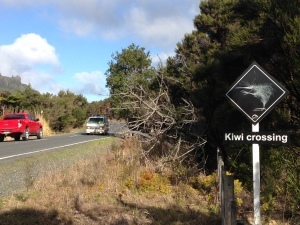 Groups along the Kiwi Coast use a number of ways to caution motorists about kiwi on roads. Mahinepua-Radar Hills Landcare, Waimate Nth Landcare Trust and Puketotara Landcare all use kiwi road stencils. Riverlands Landcare have the yellow ‘Caution: Kiwi At Night’ road signs and these have also recently gone up along King Road in Mangawhai to help protect the kiwi released at Marunui. 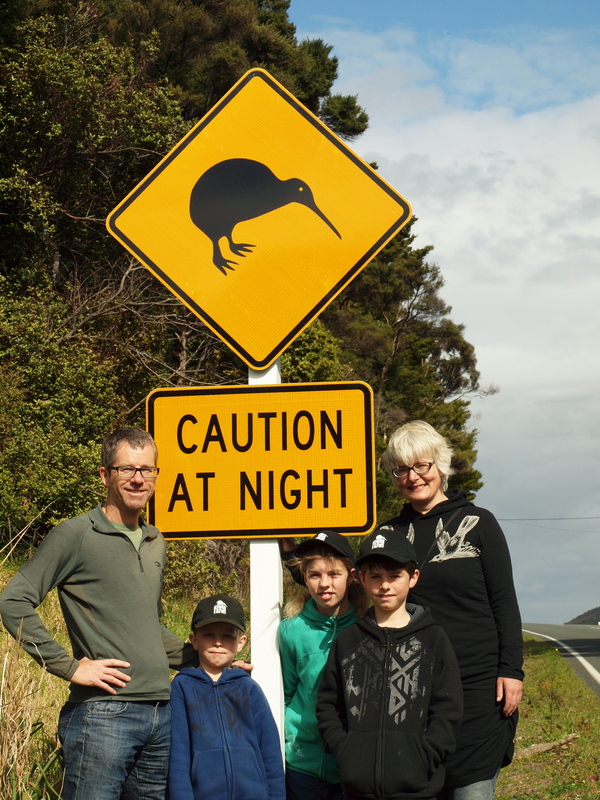 Backyard Kiwi have designed their own ‘Kiwi Crossing’ sign at a local hotspot between Nook Road and Mcleods Bay in Whangarei Heads. A recent article in the Whangarei Leader to appealed to motorists to slow down in this danger zone. Please slow down for kiwi on Kiwi Coast Roads. If you find a dead or injured kiwi on the road please call the Department of Conservation on 09 470 3304.